What exactly does this entail? Does this mean that one has to complete the mirage arena, win all the command boards, complete all of the mini games, and defeat all of the optional bosses with Terra, Aqua, and Ventus? Reports is to basically get everything to get 100%. It'll toke some time but it's possible, I did it and it felt great knowing I'm done with the reports. So you beat all of the secret bosses (YX, No heart, armor of the master, etc) with all 3 characters? You don't have to get all the Keyblades. And you will only need 1 of each ability. For mini games, you will have to win all fruitball matches for the shootlock. Cool for all beginner songs to unlock the master difficulty, and fantastic for the 3rd song. The rest just need simple attempts. You can play rumble racing in the arena to obtain the arena and mini game record in the journal simultaneously, don't even need to play in Disney Town except for story purposes. Other than these, you have to go through all story scenarios, open every chests, complete the sticker album, clear all unversed missions, unlock all ice cream recipes, clear the entire mirage arena, and fight every single enemy and boss once, with each character. Edit: And use all d-link final commands. I want to give some advice for completing the Journals since some can be easily overlooked. If you're also going for the Trinity Archives, you need to purchase every item from the Mirage Arena's moogle with each character. Well I've stated here on other threads that at the moment I'm busy with KHII FM to get everything then I'll move onto BBS FM but in my PSP version I did everything but only for Aqua (Terra and Ven are so close though). That's why I'm telling you to basically get everything as people here have stated very well and one more thing, for the D-Links, there are two versions for each character and to upgrade them you have to fight the groups of unversed and occasionally they or at least one of them that you defeated would summon something like a star or flower, similar to Mickey's Star Shard except the color is more orange if I can remember correctly. Get this quick so you can upgrade a characters D-Links. Also for this to work, you must be using someone's D-Links to get their upgrade for example: I'm using Mickey's D-Links version one in battle against the unversed, one of them summons the "shard" and I collect īt. Soon Mickeys D-Link upgrades immediately to version two. Do this for all D-Links to complete the D-Link report. And for your "Hit Records", to get all hit records for the D-Links, you have to land some hits with every D-Links finisher, that means both the finishers of version one and two of every characters D-Link. Sorry to resurface this thread but I'm still a bit confused. These things that you're saying, do we have to do them with all characters? And if the optional bosses must be encountered by all characters, does that mean that we must win all of the command boards and all of the rumble races with all characters, as well as complete the rest of the mirage arena, with all characters? And when Kazr10 said that I only need one of each ability, does this mean that I only need one of each ability total, or 1 of each ability for each character? How exactly do I find out this information? Trophy guides online for 2.5 don't seem to exist. ^ You must do the exact same thing (all mirage missions, mini games, item collection, abilities, bosses, etc) for each character to complete their individual reports. The reports are mutually exclusive. Eg. 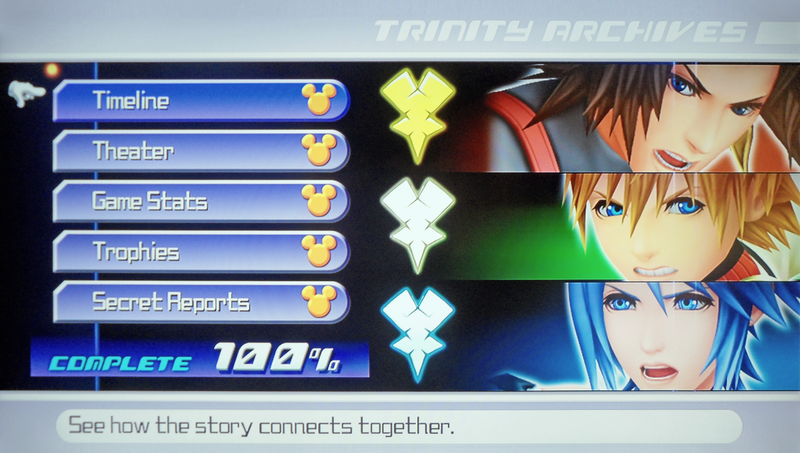 Completing mini games for one character will not gain the entry for the other two. However you have to complete Aqua and Terra's story to unlock a mirage arena mission. So to answer your individual questions. All enemies, bosses, and optional bosses must be defeated by all characters. You have to win all command boards, rumble races, fruitball matches for all characters. Pot breaking requires a single attempt for all characters. Get a cool for all ice cream songs to unlock master mode, and simple attempt for all songs except Dessert Paradise which you have to get Fantastic, for all characters. Learn at least 1 of each ability for all characters. ...wow. Ok thanks very much!